The Notre Dame Integrated Imaging Facility (NDIIF) has launched a new website, imaging.nd.edu. The new website provides a clean, modern look that aims to serve faculty and students, as well as external customers, who are seeking imaging research services. The new website offers five main pages, including an Our Services tab. Within this page viewers can directly link to the Optical Microscopy Core, Electron Microscopy Core, InVivo Imaging Core, Histology Core, and the Fabrication Core. These pages highlight each one of the facility’s five core services. Within the core pages, faculty, postdoctoral researchers, students, and staff can find information pertaining to each of the state-of-the-art instruments that NDIIF offers. Each core facility page also provide links to the professional staff and their corresponding contact information, as well as policies and rates for use. 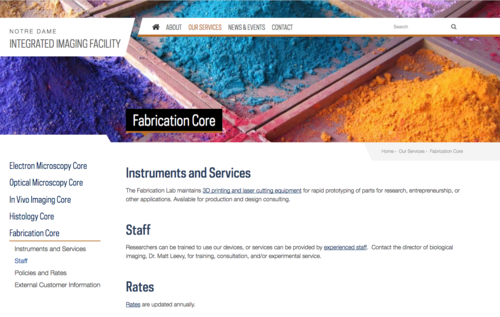 Together with the launch of a new website is the announcement of the Fabrication Lab within NDIIF. The Fabrication Lab is housed in room 010 Galvin and it maintains 3D printing and laser cutting equipment for rapid prototyping of parts for research, entrepreneurship, or other applications. The services available for production and design consulting are offered to both internal Notre Dame users and external communities. For more information specifically regarding the capabilities and possibilities within this facility please contact Matthew Leevy. Explore these sections and more at imaging.nd.edu. Originally published by Sarah Chapman at imaging.nd.edu on January 24, 2017.